Apple cider vinegar has some very specific, very important benefits for your hormones. I drink a small dose of apple cider vinegar before every meal. I literally take a shot of apple cider vinegar! Apple cider vinegar helps your body to convert the proteins found in foods into usable amino acids. Amino acids are the building blocks for many different bodily processes, including the creation of your hormones. So, in drinking a shot of apple cider vinegar you’re actually giving your body what it needs to make hormones – addressing any imbalances between estrogen, progesterone and testosterone. Apple cider vinegar balances your blood sugar, preventing blood sugar soars and crashes and supporting healthy, consistent ovulation. It improves overall insulin sensitivity, especially if you’re eating a high-carb meal that day. This is especially important for women with insulin-resistant PCOS. Apple cider vinegar contains acetic acid which helps your body to draw nutrients out of the foods you eat. That same acid can help block the absorption of starchy, bad carbs, too. Apple cider vinegar balances acid/alkaline levels in the body, allowing good bacteria to flourish in your microbiome. Your microbiome houses the estrobolome where excess estrogen is processed and eliminated from your body, preventing estrogen dominance. In cooking – I rarely use balsamic vinegars when making salads – instead I use apple cider vinegar with lemon juice to make dressings. I also drizzle it over sardines and sometimes even add it to a smoothie. In my beauty routine – I even use apple cider vinegar as a rinse for my hair to combat dry scalp and dandruff, usually after a coconut oil mask! I do the same after I use a face mask, applying apple cider vinegar as an astringent to tighten my pores. When cleaning my house – I use apple cider vinegar as a household cleaning agent to get my kitchen and bathroom sparkling. 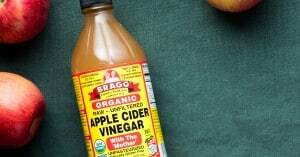 I use Bragg Apple Cider Vinegar – it’s raw and organic, the highest-quality apple cider vinegar. And because it’s never heated or filtered, it retains all its goodness so it can successfully bring you all the benefits I mentioned above. It’s important to make sure that the Apple Cider Vinegar has “the mother” – that’s the live fermentation sediment that contains all the good stuff that creates the health benefits. Bragg is always made from fresh, organic apples. It’s a versatile vinegar with a crisp, tangy taste. The difference between any other vinegar and apple cider vinegar is the “mother.” This cloudy sediment (you can see it in the bottle) includes small amounts of proteins, enzymes, amino acids, and fiber, as well as plenty of good bacteria for extra probiotic power. That’s where the acetic acid comes from. Because Bragg Apple Cider Vinegar is unfiltered and unpasteurized, it’s far more effective than other kinds of apple cider vinegar. Ready to get your hands on a bottle of this miracle elixir? You’re in luck – Thrive Market is offering my readers and followers a FREE bottle of Bragg Apple Cider Vinegar! Claim your FREE gift today before they’re all gone! I have been using Bragg’s my whole life and I’m so excited that Thrive Market agreed to give my readers a free bottle because it’s my favorite and because I want to keep bringing you whatever support I can to help you live in the FLO and keep your hormones happy. First, are you hormonally sensitive? Second, do you deal with blood sugar crashes on the daily? Click here to take The V-SIGN TYPE™ Quiz NOW. I love Bragg’s ACV! Did you drink it while you were pregnant, too? I know that unpasteurized foods are a “no no” generally while pregnant, but I have been wondering whether I really need to apply that approach to things like apple cider vinegar and kombucha. I have used apple cider vinegar on flat warts. I had hundreds on my leg. They multiplied from shaving when my immune system was week. I rubbed it on my leg 2-3 times per day for several weeks and they were gone. It was better than seeing the dermatologist and easier. I had some frozen off but they left aweful scars. Thanks, I often forget to incorporate apple cider vinegar into my daily meals and routines! Just a comment about Thrive Market.., I’m sure they’re great, but these affiliate marketing products & promotions they offer to you among others are not really “free”… It’s a misleading claim. You put down your credit card for the $1 shipping and then 30 days later they automatically charge your card a $59 membership fee. It’s shocking to me that the affiliate partners don’t mention this nor does the Thrive Market page link that the consumer is redirected to. This is bad business practice and I want to mention this to you because why would you want your credibility attached to this kind of tactic? Thanks for all your great articles! Just a quick question about acv. Doesn’t burn your throat? or erode your teeth enamel? It hurts. And now I’m sick to my stomach. Try watering it down. NEVER take a shot of acv!!!! You can do serious damage to your esophagus and surrounding tissues. You can also aspirate a bit and cause lung scarring. You MUST dilute acv before ingesting it. And yes, it can cause acid erosion to teeth. Sip through a straw to minimize acid exposure to teeth. ACV is awesome! Use with caution! How much do u in take a day to balance horomones in a woman? Unfortunately, Thrive Market is not available to Canadians. A quick question, you mentioned you take a shot of apple cider vinegar before every meal, would a shot be a table spoon? Thanks and I appreciate all you do for us ladies. That was extremely painful, and I took one sip, not a shot. Maybe warn people that straight unfiltered vinegar will definitely burn just like any other type? My stomach is still upset after chugging water afterward. I’m sticking to watered down vinegar. Check out sekanjabin, an ancient mix of water, vinegar, and flavor. I take a tablespoon of organic unfiltered raw apple cider vinegar and its mother in a large glass of water daily and it do not upset my stomach. I have been drinking Bragg brand ACV with water for about a week. I have suffered from dysfunctional uterine bleeding for 8 years, I even had to have a blood transfusion once. I also have hypothyroidism that I believe is undertreated. I have to take progesterone everyday to manage monthly bleeding. In 2014, I developed fatty liver disease and fibroids. I did not have these back when the obscene bleeding began in 2008. Doctors are unable to do anything, and they won’t believe that my thyroid could be responsible. The ACV has been helped make this month’s period more tolerable, but it is still never ending with clots and jelly-like bleeding. I am worried that the ACV is interacting with my progesterone pill, is that possible? I was in a very similar boat. I had clots that would fall out at unpredictable moments. I had flooding and pain and bleeding for as long as 3-4 months at one time. Solution: cod liver oil, food-based multivitamin, magnesium, calcium, and iron. This solution is AMAZING, especially cod liver oil, and has given me my life back. Hi Heather, My daughter is having similar issues. can you please elaborate more on the cod liver solution that you had mentioned. I haven’t had a period for three months now but I am not pregnant did a blood test and found out my tyroid level is low can drinking acv help balance my hormones? ACV is great for many things! The thyroid issue probably originated from adrenal stress and/or blood sugar imbalances. It is very important to look at diet and lifestyle, this is where we affect the body the most! Can Acv help in conception. My period doesn’t come regularly have not getting pregnant, did surgery last year equally have hormonal imbalance. Though I don’t know your specifics, I can say the if you have a hormone imbalance, this will need to be addressed in a holistic manner in order to conceive. ACV can be part of the process, but certainly not the only thing. You can start to get a handle on understanding your symptoms by downloading the MyFLOFix app. Good luck, and do reach out to my team if you want to seek further support! I am a stage IV breast cancer met to bones so therefore, I am in constant pain. I exprimented rubbing organic unfiltered raw apple cider vinegar and its mother on painful areas of my body and the pain was gone in minutes, the area was no longer sore or painful, tried it several different times, each time it worked, I could not believe it really worked, but it’s true, worked for me. WOW! Apple cider vinegar do. have good benefits. 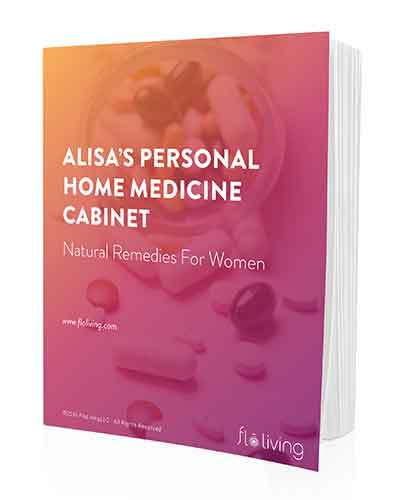 Just a quick question…I am 48, great health,have not started menopause, had a healthy period, but one week later I heard about apple cider vinegar and began using it……used it for about a week straight, 1tbsp to cup hot water, honey and cinnamon ….my period started again and has been going for 8 days…and my normal is four days every 28 days. Can the vinegar be affecting my uterine wall by interfering with my hormones? So I like to understand better about apple cider vinegar, does it decrease your hormones? Cause I’m looking for a cure to decrease my hormones. Anyone here know where i can find help? I was just diagnosed with DCIS, going to have lumpectomy. But I really don’t want radiation or tamoxifin! I have fibroids also and have had heavy periods for quite awhile. I am 53.
i also have same problem when i starting taking ACV i have been ovaluation cramps plus my period became so heavy.